The sharp drop in the portfolios of these foreign funds was largely due to outflow of short-term investments, which flowed into India during a stock market rally last year, and partly on account of redemptions in their India-focused funds. In an indication of a strong belief in India’s growth potential, long-term investors such as sovereign funds have largely maintained their exposure to domestic equities, but analysts caution that lingering policy uncertainties and a worsening macroeconomic environment might lead to even these investors paring their investments in the country. A weak global economy, high inflation and interest rates in India as well as slower growth, and downgrades in earnings estimates of local companies have foreign investors shying away from Indian markets this year, after pumping in a record $29 billion last year. Although there has been no major outflow so far at an aggregate level, top funds have seen a sharp pullout. The analysis is based on quarterly shareholding data available with BSE as of 30 September, which lists investors having at least a 1% stake. Investments worth less than 1% and funds with less than $100 million worth of investments in Indian stocks were excluded from the Mint analysis. Subsidiaries of three global investment banks—Deutsche Bank AG, Citigroup Inc. and HSBC Holdings Plc—accounted for bulk of the outflow this year. These three firms accounted for roughly half of the $16.4 billion drop in the combined holdings of foreign funds that had investments worth at least $100 million in Indian shares. Deutsche Bank, which emerged as the top FII in India for the fourth year in a row, saw its stock portfolio fall 38% to $5.8 billion this year compared with the December quarter. The overwhelming majority of funds that are invested in India through these investment banks belong to their foreign clients who are not registered as FIIs in India. Many of them prefer to invest in India through participatory notes (PNs), which are derivative instruments that allow unregistered foreign entities to invest in India through existing FIIs, or their sub-accounts in India. Subsidiaries of large investment banks—typically based out of Mauritius to take advantage of tax exemptions such as on capital gains—act as custodians of these funds. “Much of what one sees as Deutsche’s investments in India is actually clients’ money and many of them use PNs," said an executive of the bank, who declined to be identified, citing company policy. “The drop in the portfolio is partly because some of those clients are underweight on India and have withdrawn funds, while others have themselves registered as FIIs," he added. “The market fall has also contributed to the decline in the value of the overall portfolio." Thirty-three new foreign funds have registered as FIIs in India so far this year. Citigroup, the third largest FII in India, saw a sharper drop of 40% in its portfolio to $3.39 billion. The biggest investor among Citi’s several arms, Citigroup Global Markets Mauritius Pvt. Ltd, saw a 35% drop in its portfolio to $2.28 billion. Citigroup Global Markets Mauritius handles money of global clients, most of whom use PNs to invest in India. “Foreign funds who use the PN route to invest in India typically chase quick returns," said Ullal Ravindra Bhat, managing director of the Indian arm of Dalton Strategic Partnership, a global fund registered as an FII in India. “Many of them poured in money into India last year after markets started rallying in September and it is not surprising that they have pulled out since then." 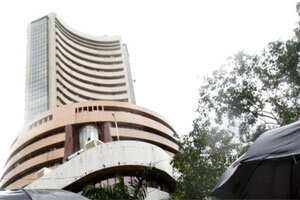 Saurabh Mukherjea, head of equities at Ambit Capital Pvt. Ltd, agreed, pointing out that many of these funds have deserted Indian shores owing to rising risk aversion globally that has affected flows to emerging markets and also because of lower growth expectations from the country. PNs as a proportion of equity investments, excluding derivatives, have fallen nearly 10% to 11.8% this year, according to data from market regulator Securities and Exchanges Board of India. The declining portfolios of these investment banks have catapulted long-term investors such as Norway’s sovereign wealth fund with assets worth $709 million and ranked 15th in 2010, to the top 10 this year. The number of billionaire portfolios has come down from eight in 2010 to five now. In 2010, FIIs with more than $100 million worth of Indian shares numbered 38, which is now down to 26. To be sure, the current bunch of FIIs is bigger and more diverse than it was two years ago. In March 2009, when the markets had bottomed out after a global financial crash, there were only two FIIs with at least $1 billion in their portfolios. There were 20 FIIs with investments worth at least $100 million in Indian equities. Redemptions in India-focused funds of these investment banks because of poor returns from the market this year has also contributed to the fall in their portfolio. Investments by smaller fund houses and index fund flows have compensated for the outflow of investments made by short-term investors so far this year, analysts said. Long-term investors have largely maintained their exposure to Indian stocks. Sovereign funds such as the government of Singapore and Norway’s sovereign wealth fund have seen an appreciation in their portfolio of Indian stocks despite a slew of negative news flow this year, while private asset managers saw a marginal decline in their equity assets. 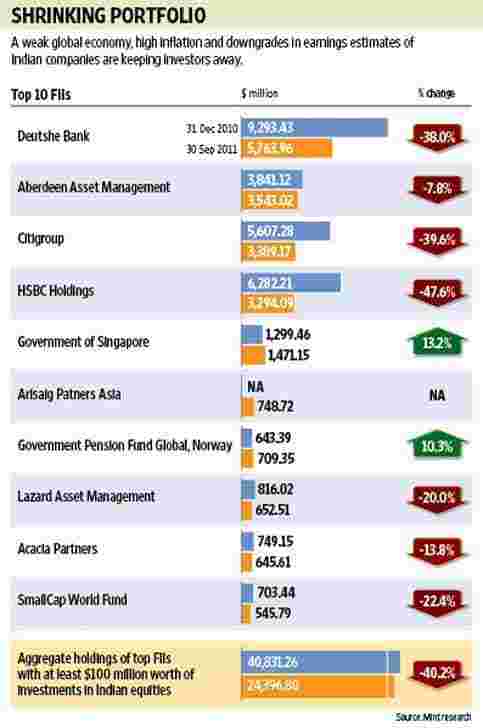 UK-based Aberdeen Asset Management Plc., the second largest FII, saw an 8% drop in its holdings of Indian stocks. “These funds are strategic investors and stay invested in a few companies for a long time," said Bhat. “But with policy paralysis persisting so long and little certainty on when the interest rate cycle in India will peak, even these investors may pare their investments." With Europe in midst of a crisis, domestic investments slowing down and persistent downgrades in earnings of Indian firms, equity markets are unlikely to see a sustained pick-up in foreign inflows anytime soon, Mukherjea said. Consensus earnings estimates for the 30-share Sensex in fiscal 2012 has dropped from Rs1,222 per share at the start of the year to Rs1,177.3, according to Bloomberg data.